amorphous mass of crime solvers (an exception being Buck Marshall, Range Detective, who did his detecting out West and dealt with stage coach robbers and cattle rustlers). But Speed Saunders, Ace Investigator, must have had something going for him. 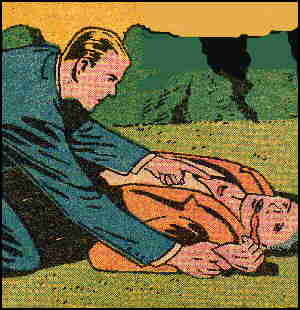 Not only was he in the lead position of the first issue (March, 1937)  he was also the first of the Detective Comics detectives to appear on the cover, which he did on #4 (June) (the first three covers showed bad guys). In fact, he appeared on no less than eleven covers  more than any other characters except Batman and Robin, who have spent decades as the main stars of Detective Comics. Among the detectives of Detective Comics (which the publisher, DC Comics, soon named itself after) were various private eyes, cops, even spies. But it's hard to say exactly what Speed was. He didn't seem to be much of a policeman, tho policemen who turned up on his cases didn't seem to mind taking orders from him. At times, he also seemed to be an FBI agent. Among the few certainties about him is the fact that his actual first name was Cyril. His first story was written by E.C. Stoner (Phantasmo) and drawn by Creig Flessel (Shining Knight). But Stoner only wrote one or two more stories about Speed, and may not have had much of a hand in creating him. There are reports that Speed was actually created by Gardner Fox (Adam Strange), who wrote most of his early stories. Other than that, the creator most often involved with him was artist Fred Guardineer (Zatara the Magician). Given comic book trends of the time, it's not surprising that Detective quickly filled up with more superhero-like detectives, starting with The Crimson Avenger in the October, 1938 issue. After the 58th issue (December, 1941), Speed was crowded out. A couple of issues later, Air Wave joined the cast. Once gone, he was forgotten. It was decades before Cyril "Speed" Saunders turned up again in a comic book. When he did, it was as a superannuated supporting character in the 1999 oneshot revival of Sensation Comics, which didn't remotely resemble the old Wonder Woman vehicle from the '40s. There, he was tied with the old "Shiera Saunders" character, who'd been married to Hawkman  and Shiera's name wasn't even Saunders, but Sanders. One wonders why they didn't take the trouble to make him related to Vigilante, whose name was also Sanders, but at least his had occasionally been mistakenly given as "Saunders". According to this latter-day retcon, Speed was a cousin of Shiera's. Also, he had a granddaughter, Kendra Saunders, whose body was taken over by the recently-deceased Shiera when Kendra attempted suicide at age 17. Kendra is the current Hawkgirl. Even a lifetime later, no comic book character is too minor and off-genre to get sucked into a superhero universe. Text ©2011 Donald D. Markstein. Art © DC Comics.